Professional Appliance Hand Trucks Transport Large Equipment and other Materials for Industrial and Commercial Applications. 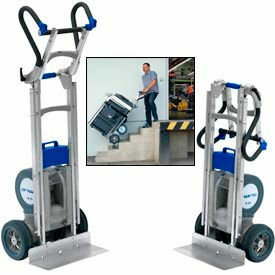 Professional Appliance Hand Trucks are made of high quality materials for long lasting durability and dependability. Trucks are designed for handling and transport of large equipment including refrigerators, washing machines, and more. Handle design allows convenient maneuverability and balanced control. Ratchet assembly with nylon belt secures the load for easy transport. Low friction continuous belt Stair Climbers allow ergonomic stair accessibility. Available types are 2-Wheel and 4-Wheel. Weight capacities range from 500 to 1800 lbs. Dimensions vary per model. Wesco® StairKing Battery Power Stair Climbing Appliance Hand Trucks are Labor Saving to Reduce Worker Injury and Fatigue! Wesco® StairKing Battery Power Stair Climbing Appliance Hand Trucks allow one person to safely move heavy appliances up and down stairs with a simple fingertip control. These motorized hand trucks feature a 1/2 HP, 50 amp high-torque motor that gets over 80% more lifts per charge than competitors' hand trucks and runs cooler under heavy loads. Unit can navigate 6 steps in 37 seconds. Powered Hand Trucks have an industrial grade gearbox with chain drive to provide steady movement and superior reliability over belt-driven trucks. Continuous tread stair climbers and 2" diameter polyurethane lifting feet grip firmly without damaging steps. Motorized Hand Trucks include a sealed maintenance-free 12V battery, 115V charger and circuit breaker. Wesco® StairKing Hand Trucks are made using a lightweight alloy frame with all welded I-beam construction. Strong nylon belt and positive ratchet mechanism with auto-rewind ensures safe and secure load lifting. 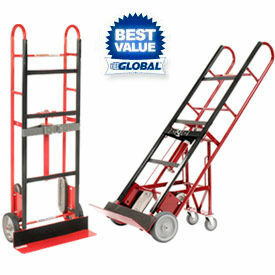 Stair Climbing Hand Trucks include 6" mold-on rubber wheels and a 24"W x 4"D noseplate. 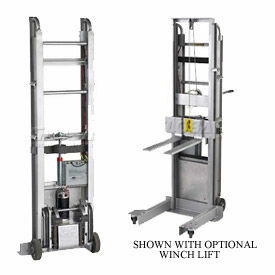 Wesco® Liftkar® HD Series Powered Stair Climbing Appliance Trucks provide Safer, Faster Material Handling on Stairs. Lightweight dual-rail aluminum frame and a 21"W x 7-½"D extruded aluminum noseplate are constructed for years of service. Ergonomically designed handles have non-slip rubber coating for maximum comfort. Safety cargo strap is included. Foam-filled 10-¼" wheels are puncture proof and are used for rough surfaces like gravel or cobblestone. 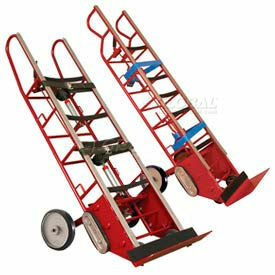 Folding Handle truck's upper handle angle can be adjusted allowing the user to stand upright. Best for copiers, safes, heavy motors and other loads that would require the user to pull the load back to a very low position. Optional Snap-on Toe Plate provides 21"W x 14"D of cargo space to allow moving loads without tilting the truck. Four 2" dual wheel swivel casters make this especially useful in confined areas. Fits both Standard and Folding Handle trucks. Wesco® Heavy Duty Vending Machine Trucks feature a Rear Wheel Design that Allows the Truck to be Tilted Back to Clear Doorways, Making it especially Useful for Moving Vending Machines or other Tall Cargo. In the cargo transport position, the Wesco® Heavy Duty Vending Machine Truck rests on two 10" mold-on rubber rear wheels and two 5" mold-on rubber front wheels. The front wheels feature wheel locks that allow the Truck to be placed in the upright position with no danger of the Truck rolling away from the operator. The wheel locks are activated by a conveniently located hand lever at the top of the Truck. Twin nylon web cargo belts with eccentric ratchets offer maximum load security. Vending Machine Trucks feature a durable 1" diameter steel tube construction for long life and a ¼" thick steel noseplate. Wesco® Liftkar® SAL Series Powered Stair Climbing Appliance Trucks are the World's Most Advanced Stair Climbing Hand Truck! Lightweight and durable aluminum frame is designed for years of service. Ergonomically designed handles have non-slip rubber coating for maximum comfort. Choose from four different handle styles and two different wheel types to suit your application. Note: Noseplate sold separately. Choose from many styles and sizes to best suit your material moving needs. Wesco® Folding Handle LiftKar® HD Stair Climbing Appliance Truck 274101 725 Lb.